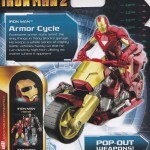 A few Iron Man 2 stores have been found at Toys ‘R’ Us stores in the west coast(Texas/California). The street date is March 1st, however some of these toys were sighted after the press release was released last week. Does this mean that the street date has been pushed up? We aren’t sure, but the the release for these toys hasn’t been widespread. In any case, we won’t be waiting too much longer as March is just a month away! Click on the title bar to see more! Discuss on the Toyark Forums› Views: 6451 › Credit: topnotch97 of the Toyark Forums! 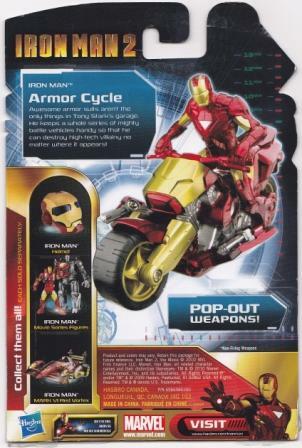 Ive got to ask why do they still make the bikes with the figures partially molded to them...I mean come on have toy designs advanced enough to move past that...Ive always hated those. Are these vehicles for 3 3/4 line or remote controlled vehicles? I think the car is 3-3/4"
Did someone say Batman tumbler? I might buy this bike if it looks like it might crossover well for some other MU figure. Moon Knight maybe? The Vortex looks nice, and the cycle doesn't look too bad. However, both don't interest me all that much. 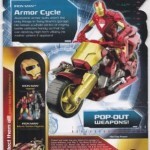 I know it's just for the toys, but, does anybody else think it's odd seeing Iron Man riding a vehicle? While he's in the armor? Sure. 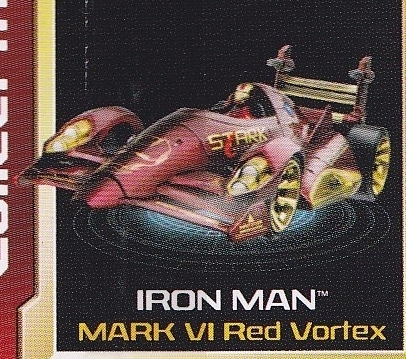 Why not a replica of the Stark racecar (with break-apart action™) from the preview with figs of T.S. w/ armor briefcase and Whiplash. that scene is just begging for it. 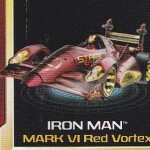 Why not a replica of the Stark racecar (with break-apart action�) from the preview with figs of T.S. w/ armor briefcase and Whiplash. that scene is just begging for it. Which will hopefully come with stark in his racing suit. Actually, I have to admit, the Vortex car looks kind of sweet. I saw it in person at TRU yesterday and really liked the paint color on it. It would fit real nice with other 3 3/4" vehicles and could be a great starting point for someone who wants to make a custom M.A.S.K. vehicle. That's not an excuse for vehicles that can be taken from the movie the line is based on. Kenner and Hasbro are both used to this, so the race car not being the stark race car seems odd for them (robocop, batman, etc back in the day). Unless it's a placeholder for that once the movie is released. Movie lines are weird like that, when you have contracts that deny you from releasing even details of certain things till the film hits theaters. For the ATVs and motorcycles though yeah, surprisingly there really is a market for those pull back and go racers with kids. Wait for the Tony Stark blue and white repaint, and nag hasbro till they do it! I'm pretty much feeling the same. It does look cool, but it is a totally unnecessary vehicle. I don't care what anybody tries to argue, sorry Snowflakian. Iron Man does not need a car. This doesn't come with Tony Stark. It comes with Iron Man. It's the same as Hulk, Spider-Man and whoever else they put on ATVs. Completely unnecessary. But, as mentioned before, it does look cool. If it came with Stark in a racing uniform I would definitely consider getting it. 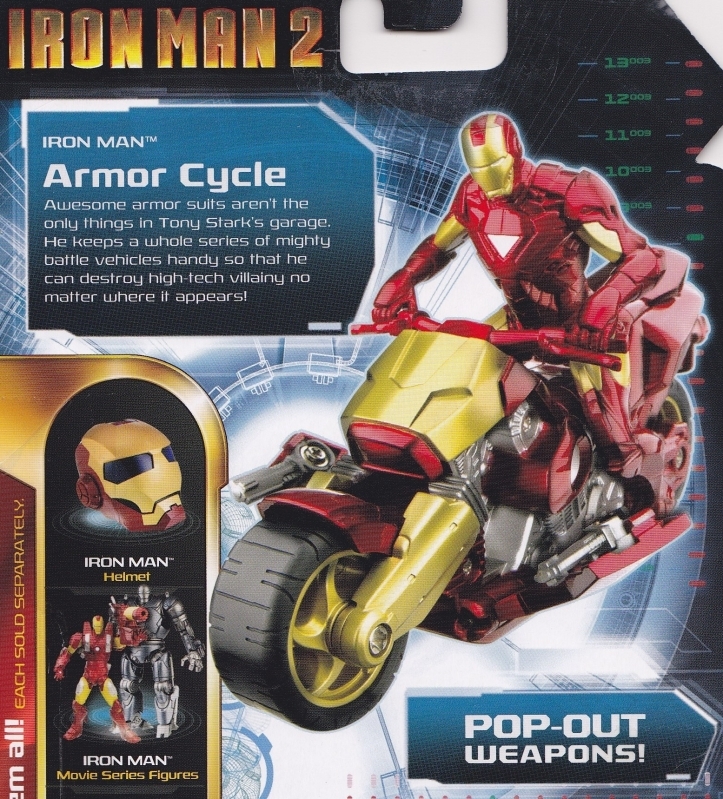 The pull and go racers are a different story entirely though, but kids like em, so what can you do cept be happy that Ironman merchandise is getting kids ready for figures when they get older (2-5 year olds predominantly on the atv/bikes). Hmm, apparently the red and gold car is in the movie after all. I don't think it's stark's car, but it looks like it gets destroyed in the same scene at the end of the newest villians clip from Entertainment Tonight. Meet The Villains Of 'Iron Man 2' End of the clip on that article. Hmmm I'm still split on acquiring the car. Spiderman 3 3/4 came out with a car and we know we are getting a rolling fortress sometime soon. I don't know....it seems like vehicles within the MU line are coming and the collector in me is wanting to invest in the car just for the sake of having it.